Senior World medalist Daryl Homer is seeking his first Grand Prix medal on U.S. soil in Boston this weekend. (Colorado Springs, Colo.) – At 48 athletes strong, the U.S. contingent is coming into the Absolute Fencing Gear® FIE Grand Prix Boston this weekend looking to capitalize on the opportunity presented by hosting one of only three Grand Prix events in the world here on American soil. The two-day competition will begin on Saturday at Harvard University’s Gordon Indoor Track – previously the home of the NCAA and Ivy League Championships. More than 160 men and 150 women will be whittled down over the course of the prelim rounds to those who make the cut for the round of 64 on Sunday. With the top 16 in the world exempt from the pools and moving straight into the table of 64, Team USA will be looking to take as many positions in the field as possible. In 2014, at the inaugural Absolute Fencing Gear® FIE Grand Prix New York, the U.S. men earned four trips to the table of 64 while the American women led the field with a total of 10 advancing to the second day. Last year, two-time Olympic Champion Mariel Zagunis (Beaverton, Ore.) won bronze while her 2012 Olympic teammate, Daryl Homer (Bronx, N.Y.), advanced to the quarter-finals. The most decorated U.S. fencer in history, Zagunis has had consistent success at events held in the United States, winning medals in six out of the seven international saber competitions that have been held in the United States since 2010. Ranked No. 5 in the world, Homer became the first U.S. man to win an individual medal in saber at the Senior World Championships and is looking to build on the silver medal he won in Moscow this year. Both Zagunis and Homer are joined by a talented group of teammates who are chasing both gold and points towards qualification for Team USA at the 2016 Olympic Games. In addition to Homer’s history-setting result in the 2014-15 season, his teammates have had some key wins as well, including Harvard sophomore Eli Dershwitz (Sherborn, Mass.) who had a breakthrough season in 2014-15, winning both the Senior Pan Am Championships and Games golds as well as the Junior World title. 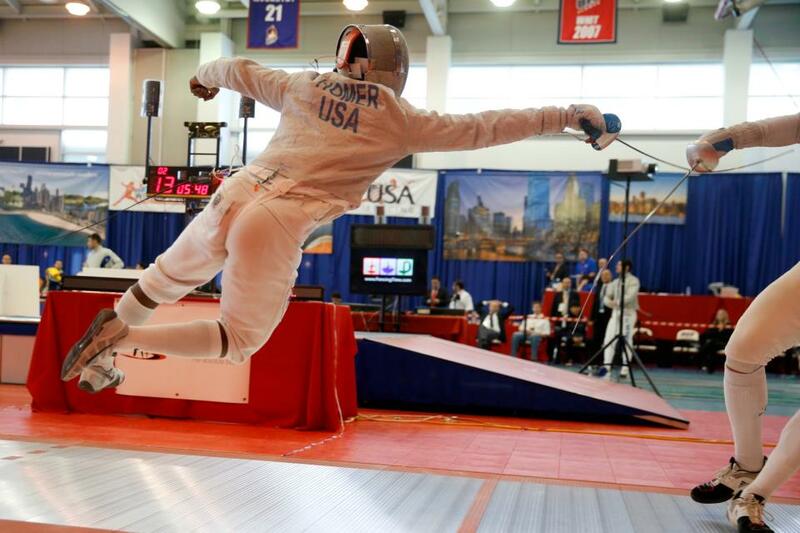 While Dershwitz is the only U.S. fencer besides Homer to reside in the top 14 in the Adjusted Olympic Rankings, two of their 2015 Senior World teammates are hoping to pick up big points in Boston and jump past Dershwitz and Homer in the rankings. London Olympian Jeff Spear (Wynantskill, N.Y.) climbed the standings after his bronze medal finish at the Pan American Championships, but will need strong finishes in the next few tournaments to earn a second trip to the Games as only two men per nation can qualify for Rio. Competing in his adopted hometown, former Boston College captain Peter Souders (Silver Spring, Md.) made his Senior National Team debut at the 2015 Pan American Championships where he placed in the top 16. Zagunis’s London Olympic teammate, Dagmara Wozniak (Avenel, N.J.), earned a career-high No. 3 ranking in the world last season and placed second at the Pan American Championships before an injury hampered her run at the individual Senior World podium. The 2014 Senior World Team Champion is sitting in third in the U.S. rankings as she seeks to qualify for a second Olympic Team as the U.S. women are expected to send three individual athletes and a fourth as a replacement athlete for the team event only. Ibtihaj Muhammad (Maplewood, N.J.) recently moved up to No. 2 in the U.S. standings after a season that included a silver medal at the Seoul Grand Prix in March. Muhammad is now ranked 11th in the nation and is aiming for her first Grand Prix medal at a U.S. tournament. After her gold medal win at the December North American Cup, four-time Junior World medalist Sage Palmedo (Portland, Ore.) moved up from No. 5 to No. four in the rankings, passing 2014 Senior World Team Champion Eliza Stone (Chicago, Ill.) by a narrow margin. Watch for both athletes to be at their best as every point counts in the quest for a berth on the 2016 squad. Two-time Senior World team medalist Daria Schneider (New York City, N.Y.) grew up in nearby Brookline, Mass. and will be fencing in front of a hometown crowd in Boston as the former World Cup medalist is seeking to return to the podium. In addition to the 20 U.S. men and 20 U.S. women selected to compete in the tournament, eight athletes were selected on Friday to fill out the pool rounds, giving Team USA a total of 48 fencers. With four exempt from pools, the Americans will have 42 fighting on Saturday for a chance to compete in the second day. Click here to view entries and live results throughout the weekend.